Hamlet Linden: About three years ago, Stanford legal scholar Lawrence Lessig stood before the nine Justices of the United States Supreme Court. From one perspective, he was arguing over the interpretation of a single sentence in the US Constitution. From another angle, he was fighting for the very future of ideas and art-- in America, and by extension, the world. His most recent book, Free Culture, is a story of that ongoing battle-- what led up to it, how he fought it, and where we can go in the aftermath of the Court's decision. And though it may seem strange, it's actually quite appropriate that he takes his case here (so to speak), in avatar form. As we'll soon find out. So ladies and gentlemen, from the office of Linden Lab in San Francisco and this hilltop auditorium of Pooley, please join me in welcoming Professor Lawrence Lessig. Before I turn you over to Philip Linden, I wanted to start off with a few questions on Free Culture to set the context. Let's say you get in the elevator with Senator Orrin Hatch and Daniel Robert Glickman, the new head of the MPAA-- what point from Free Culture would you convey to them, in the short time you have? Philip Linden [grinning]: We all do that at least once. Lawrence Lessig: So the thing Orrin should be asked is this: how come the government is spending so much energy regulating creativity? Where's the Republican in that? And second, how come spending so much time protecting this powerful industry against competition, rather than embracing competition as the way we find a new world. Two quick questions before floor three. HL: Now let's say Senator Hatch and Glickman get out, and in comes a kid who likes to download lots of music and movies via peer to peer-- what point from Free Culture would you convey to him? LL: I don't have anything to tell the kid. The kid is teaching us something. If you look at the creativity kids have demonstrated using digital technology, that's enough to say that we, professors, lawyers, congressmen, should listen, not lecture. HL: But what do you tell him [if] he wants to get involved with teaching us more? LL: Well, he should want to teach us more, because we or the government are quite good at destroying. And the one thing they seem most keen to do is to use the law to protect dying industries, and in that way destroy new worlds. So to speak. HL: It's been nearly two years since Free Culture was published. What significant changes in the world of media and the entertainment industry have you seen since then, and how have they enhanced or modified the arguments you were making in the book? LL: The explosion of what I call (but would love a better word for) the "read write Internet". The key thing we're seeing now is the Internet used to create and remix culture. The focus two years ago was peer to peer filesharing. 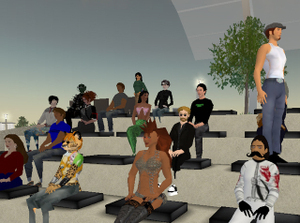 But the focus today is the stuff that happens here [in Second Life]. Or in mashups. Or with remixed music. Or anime music videos. This capacity and this creativity is extraordinary. And yet the "war" that that the copyright industry is waging against "piracy" will kill it. At least as a legitimate part of culture. HL: Tell me a little bit about pleading the Eldred case before the Supreme Court in 2002, and how difficult it was to write about the experience so self-critically. LL: So Eldred began in 1998. I was a new professor at Harvard. I was a believer in what the law could do. I saw this law -- the Sonny Bono Copyright Term Extension Act. An act that extended the term of copyright for EXISTING works by 20 years. [Eric Eldred wanted to continue uploading works of literature online, as they entered the public domain, and sued for the right to continue doing so against the Bono Act. - HL] The 11th extension of existing copyright terms in 40 years. And I compared it to the Constitution, which says that Congress has the power to PROMOTE THE PROGRESS OF SCIENCE by securing FOR LIMITED TIMES exclusive rights to authors for their writings. And it was clear to me that current practice was inconsistent with the framers’ intent. Now I had clerked for Justice Scalia. An originalist. A conservative. And so I knew quite well the philosophy of the conservatives. And they believe that you interpret and apply the Constitution as it was originally intended. So I thought: great, we go to the Supreme Court, we show them this law and the original Constitution, and the conservatives will agree with us because of originalism and the liberals will agree with us because of the burden on free speech, and we'll get nine (actually eight -- there's one really pro-copyright person on the Court) on our side. When we got close to the argument at the Supreme Court, a friend, a law professor, said to me: so I'm convinced you're right on the law. But tell me the last time the Supreme Court voted against all the money in the world. I told him he was being really boring. That's not how the Court thinks. He understood something more than I.
HL: In your argument before the Supreme Court, Justice Kennedy asks you for empirical evidence that extending copyright has impeded cultural progress. You keep the focus on a point of Constitutional law, though you now regret not citing such evidence. If you could do it over again, what empirical evidence would you give Justice Kennedy and the Court? LL: Yeah. It was a good question. The problem is it's hard to point to evidence as in stuff people have counted. But things since then have made the issue clearer. Think for example about the Google book search project. Google wants to index 18,000,000 books and make them searchable. If the book is in copyright, you'll get a "snippet" around the search. If it is not in copyright, then you can see the full book. Of the 18 million books, 16% are out of copyright. 9% are in copyright and in print. That means 75% are in copyright, but out of print. Now the publishers say you need to ask permission before you index these books. But how do you ask the 75% of 18 million authors when we have no list of copyright owners, no record of who owns the rights, no way to track down current claimants at all. Yet it stands in the way-- and now threatens Google with a huge law suit-- because the term gets extended and extended. The term for the framers was 14 years, renewable once. It is now life of the author plus 70 years-- which for someone creating in the way Irving Berlin did, would be 140 years. So, Justice Kennedy, does blocking access to 50-75% of the books in our tradition constitute a burden on our culture? HL: If you said all that, do you think the case could have turned your way? LL: People who know stuff say there was no way to win. I still think that two things could have changed their view. First, I should have been meaner to the conservatives. I should have held their feet to the fire of their own principles-- directly telling them that they couldn't consistently decide that Congress was free to make up whatever term they wanted and that it was limited in all the ways the conservatives have limited Congress. It should have been framed as a-- you choose-- principled or political, question. The second thing would have been to make the case less about Mickey Mouse, and more about the rest of culture that gets locked up just so we can protect Mickey. Probably 90% of the creativity that had its copyright extended is not commercially available at all. For creativity like films, that means that that works is totally inaccessible. And when the copyrights for those films expire, the works themselves will literally have expired-- film decays; it will be dust before the copyright ends. The point is they should recognize that they're choosing-- either help Mickey, or help preserve and make accessible our culture-- at least on terms different from the terms that Hollywood offers. HL: OK, I think that sets the framework for the book-- I want to turn over the floor to Philip to let him discuss your relation to Second Life and other themes of these ideas impacting with virtual worlds. 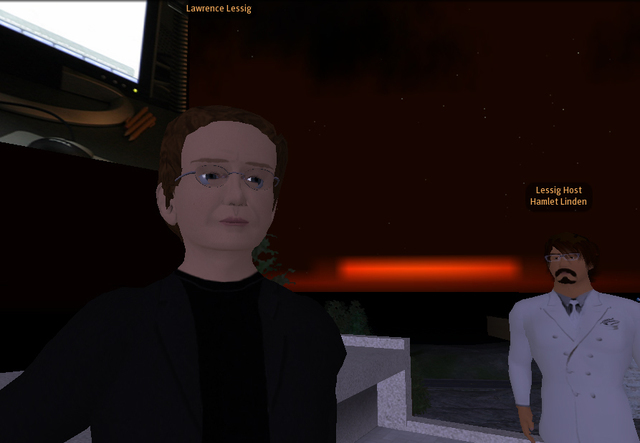 Thoughts on law and IP in virtual words, in Second Life, and in Lessig's writing. Philip Linden: Lawrence, it is such an honor to have you here! Lawrence Lessig: It is great fun. 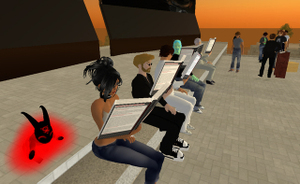 PL: Our world, Second Life, is an opportunity to take a look at the rules that govern society and to the extent that we are able, re-write them as best seems to fit us. And Free Culture is such an incredible explanation of some of the things we need to hold dear in this consideration. PL: ... and switched to our system of land ownership. Clearly, looking at the last two years, this was the right call. As every free society has discovered. We have realized, more and more over time, how much SL is a developing nation, and how, if we want to succeed, we must make the choices which fastest and best advance us all. These sorts of choices are at the heart of Lawrence's work. 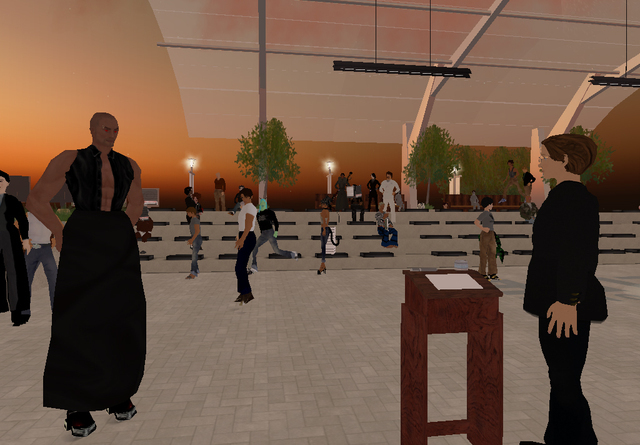 One thing that I have often said about Second Life, is that it is a kind of time machine, a place where innovation is rewarded, or perhaps ideas fail, or businesses rise and then decline in a fraction of 'real world' time. What I was struck by in reading Free Culture is how important this idea on time becomes! By extending copyrights, we are going in exactly the opposite direction. Slowing progress in the real world. In the same way we can hopefully speed it here. In the beginning of Free Culture, you tell the story of air rights, of how overflying property is a public good. LL: Yes, a problem you've dealt with. PL: This is SO relevant and topical in SL. Something we've all struggled with, how to balance freedom and ownership with progress and benefit for all. I wanted to ask you a question, that I think folks in SL will really relate to, and is an example of where we are at the edge of the envelope. 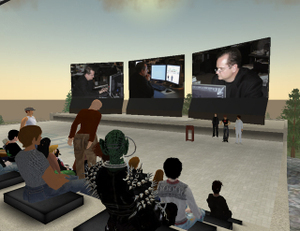 I interviewed a person for a job at Linden Lab the other day, and she was telling me how one of her dreams for using Second Life was to build the sets of movies and allow people to act out the endings in a different way to be a part of the movie. But then, of course, she paused and said, "Oh, but wouldn't that be illegal?" I think she really didn't know. I think I don't really know. And that is what your book is all about. I don't think that exactly motivated her to go in there and start working on Finding Nemo. What do you think would happen to her if she did? 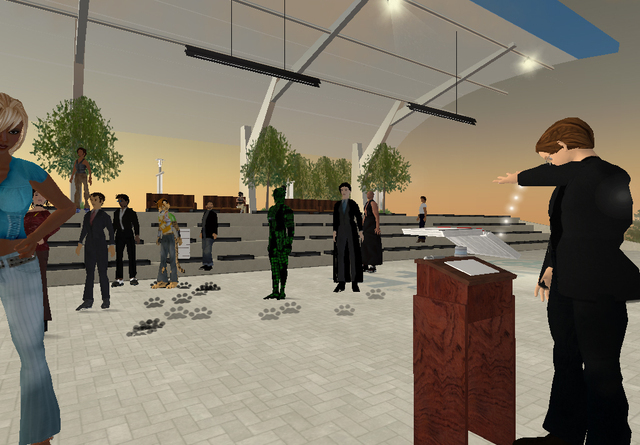 LL: So Second Life is prominent. It would get shut down. It is a totally simple application of existing law. You're publishing a derivative of the movie. You need permission from the movie owner. But what the lawyers don't think about is how much of ordinary life they're rendering illegal by this way of thinking. Because as life moves online we should have the SAME FREEDOMS (at least) that we had in real life. There's no doubt that in real life you could act out a movie, or a different ending to a movie. There's no doubt that would have been "free" of copyright in real life. But as we move online, things that were before were free, now are regulated. That's why people here are so important to this debate. You have got to make the (clueless) politicians aware of what 19th century law is doing to the 21st century. They don't get it. They think they're stopping "pirates" when they stop all sorts of creativity. PL: Given how fast things change in SL, how long would you make copyrights and patents hold? LL: And one complication you might have is that in-world, if copyrights are different from out of world, then you'll have something protected in real space, not protected in-world. But maybe that's fine. I don't know enough to say how things should be here. But I do have a sense of the questions you should ask. PL: I agree that one key question is the duration of [the] value of a work. Perhaps this is something we will be able to see statistically, given that our world here is so transparent, and better inform the debate. Calix Metropolitan [from the audience]: Transparent? LL: One point though, regarding duration. It might be fun to experiment [with] different terms, and see how that matters to growth, or creativity. PL: Yes, it's a good point. Let an answer evolve. Well, I probably can't think of questions as good as those from all of you. 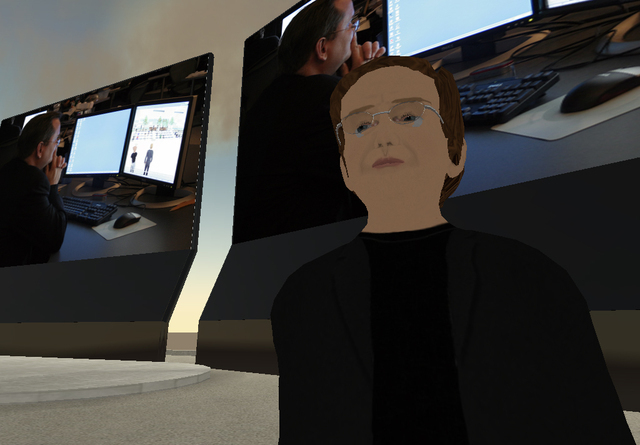 And, in true Second Life style, I am currently sitting in a restaurant in Austin, Texas with some folks from MIT and a leading ad creative agency watching over my shoulder. LL: Now I'm really hungry. PL: Well the food isn't here just yet! Quantum Waves [from the audience]: Drooling? Hamlet Linden: Actually, I had one related to Code, and then we'll turn to the audience... let's talk a little about that section of Code you're rewriting for the revision, that deals with virtual worlds. HL: In it, you describe an online world where two neighbors resolve a property dispute by changing the very code of the objects they own-- in this case, virtual poisonous flowers and a virtual dog. The solution is for the one with the poison flowers to re-code them so they don't kill the other neighbor's dog. You describe this as a positive outcome for both parties, but can you see how it might also be a socially negative outcome, too? Instead of trying to find a compromise that doesn't break the shared reality of their world, they alter it in a way that threatens to break the illusion. LL: That's a great point. And in fact I interviewed this guy to my left [i.e. Philip Linden] last week, and was trying to get the same idea. When does it make sense to code a solution, and when does it make sense for people to work it out? I like to think about different "modalities of regulation" (that's the way a professor needs to talk). One is code. One is law. One is norms and one is markets. And the hard question for me is when does a designer decide-- don't code a solution. Let them work it out themselves. Not because it is hard to code. Maybe it's totally simple but because people should work it out, not have it solved [through code]. PL: It has been a hard problem for us-- when to code. Probably we code too much, in restrospect. LL: With god sitting in on the conversation. Audience questions on fair use in parody, cultural control by media conglomerates, lack of democratic participation in online worlds, transfer of IP rights from the virtual to the real, and much more. 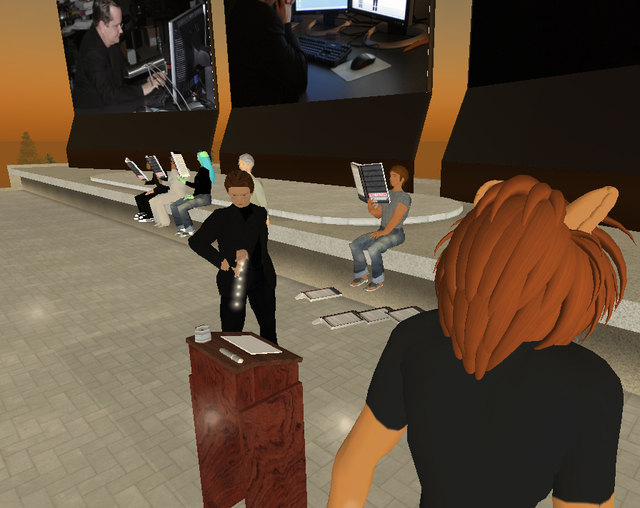 A Creative Commons jurisdiction in SL, coping with government censorship online, and other questions-- followed by a virtual autograph session. Hamlet Linden: jesz Murakami asks, “When you talk of [copyright] warriors -- do you see them as pawns in a deeper war... that the status quo of this is truly feared?" Lawrence Lessig: The status quo is afraid, but I don't think they understand what they are afraid of. They've got quarterly earnings and no tenure and new technologies they don't know how to monetize. So they do what everyone threatened does. They attack. That's why I think it is best to build the alternative without destroying what they're doing, and then let people understand its values. LL: They could complain if it was unclear who was responsible for the stuff. So if you start producing Coke and call it Coke, I'm sure they wouldn't be happy. n equate to any currency through [Linden Lab currency exchange] LindEx trade)?" LL: So in principle, a copyright is only violated if you copy someone else’s work. That makes proof very difficult, because if there are just a few ways to do something, there's a complicated question about whether it can be copyrighted, and then a hard question to know whether the defendant really did even see the original that he is alleged to have copied. I do know that on Democracy Island (I believe) they were demo-ing a Creative Commons tool-- very cool implementation. But we don't have an SL founders copyright. HL: Oh yes, be sure to check out Zarf's Creative Commons machine. LL: It is, and I'd love to build [a Founders Copyright tool] here. But we've not yet done that. Volunteers? Regarding building Creative Commons here, you know, we have a program to port licenses into different jurisdictions. Maybe we should add Second Life to that list. There are 70 countries now in the process of doing that. Why not a virtual jurisdiction? LL: The Yahoo issue is hard. Microsoft and Yahoo are big; they're not the Chinese government. So how they decide how to live there is a complicated question. I don't think a company on its own can choose to ignore the law. So either leave or obey the law-- or get the US governmentt to back them up for defending rights that ought to be defended. LL: It has not, but there's nothing really creative or novel in the Creative Commons licenses. They are just copyright licenses following the teaching of the Free Software Foundation. If someone violates the license, they violate the underlying copyright. So just as any software or content licenses protects the copyright owner, Creative Commons licenses do as well. Big difference though is that CC licenses grant freedoms that wouldn't otherwise be there, while ordinary copyright licenses impose restrictions. So no test yet, but I'm not worried when one happens. HL: OK, last question from me (exercising host rights). [In Free Culture] you suggest some specific solutions to improve the current copyright regime, but are somewhat general about how the voting public might come to support them. What's the best way of convincing average voters that this is important enough for them to call their Congress person? LL: The key is for people to see the creativity these spaces invite. They need to see the stuff their kids do (other than downloading every song ever recorded), and then they need to see how the law treats that kind of creativity. My favorite recent example is Anime music videos. They are extraordinarily creative, amazing stuff, totally illegal under the law as it is. People have to see the creativity and then ask, “Why is this illegal?” And when they ask that question, some at least will ask it of a Congressperson. We should get some Congress people in this space. I could get a couple if you want. LL: I also think Judge Posner should come here. LL: That would help lots-- for people to understand by seeing. HL (grinning): Why not Justice Scalia too, while we're at it? 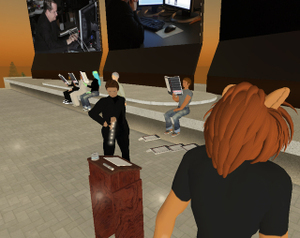 After the Q&A session, the audience lines up for the autograph session, each fan placing a copy of the virtual edition of Free Culture near the writing desk. When Professor Lessig clicks on the table, a ray of light emanates from his avatar, and a digitized copy of his signature is permanently displayed on the cover. 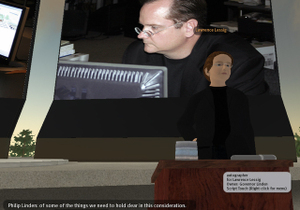 Professor Lessig's avatar is by lilith Pendragon. Publisher of the SL edition of Free Culture is Falk Bergman, who also created the autograph technology. The Pooley auditorium was created by Adam Zaius with help by Oz Spade. Co-hosts were Philip Linden and Jeska Linden; Coffee Linden provided ushering and security services. The event was first proposed by Eggy Lippman, who also set it in motion by contacting Professor Lessig. "Free Culture", the group created for reserving seats at the Lessig event, will continue on, running in-world events related to Lessig's ideas and projects, including Creative Commons and copyright reform-- some of which, hopefully, will involve Professor Lessig himself. To get in the group from SL, select Find> Groups, then search and join "Free Culture". If you're interested in becoming an officer in this group, helping create and organize future events, contact me-- "Hamlet Linden", or [email protected], via e-mail. Beautiful article, wonderful event! It's always humbling to discover how much happened in this world before you were ever even born. Thank you for hosting and presenting such a seminal thinker of this age in our world!